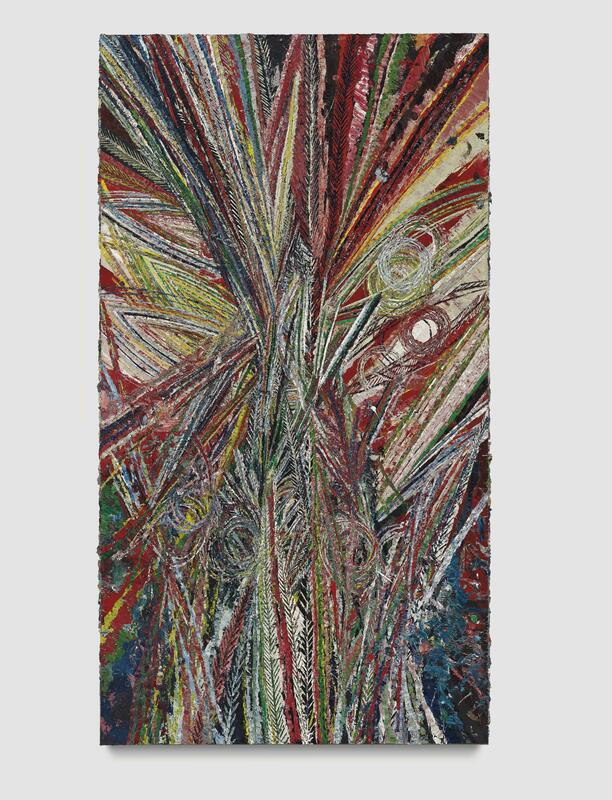 "Mark Grotjahn's new paintings are harsh, elegant things that enthrall the eye and splinter the mind. They emphasize painting as a psychic and bodily process fueled in part by the devouring and digesting of previous art to formulate a new synthesis. In particular, these large, vertical cardboard-on-canvas works appear to feast on the painting and sculpture of early Modernism, when abstraction and representation were not seen as mutually exclusive. Possessing a torrential force, they are not so much covered with thatches of thrashing, tensile lines as bursting with them, as with live, barely controlled wires," (R. Smith, "Mark Grotjahn: Nine Faces," in The New York Times, May 12, 2011, http://www.nytimes.com/2011/05/13/arts/design/mark-grotjahn-nine-faces. html?_r=0 [accessed March 18 2014]). An ebullient spectacle of line, color, pattern and texture, Mark Grotjahn's Untitled (In and Out of the Darkness Face 43.01) is a powerful work from his acclaimed series of Face Paintings. As one of the most significant cycle of works within the artist's recent oeuvre, the Face Paintings vividly exemplify Grotjahn's exquisite pictorial surfaces and his celebrated mastery of optical effect. Indeed, observing the present work, we are at first glance bewitched by a vortex of disorientating radial lines, executed in rich streaks of layered impasto and interspersed with swirling ellipses and spirographs that span the full gamut of the chromatic spectrum. Gradually, recognizable forms begin to emerge from the midst of this elemental drama: the unmistakable almond shape of an eye, repeated in skewed alignment and bisected by vertical cascading lines that suggest the bridge of a nose. This abstract anatomy, evocative of tribal masks and almost sculptural in its execution, subsumes the viewer in a hypnotic fervor and induces a primal heightening of the senses. It is in their ability to navigate between the abstract and the figurative, the technical and the totemic, that these works take their place among the twenty-first century's most captivating painterly projects. The Face Paintings may be seen to extend the primitivistic aesthetic pursued by much early Modernist art, with strong connections to the mask-like faces captured by Picasso and Matisse. Indeed, Picasso's 1907 masterpiece Les Demoiselles d'Avignon has been variously cited as a specific comparative for the Face Paintings. Yet their field of visual reference may be seen to extend even further, invoking the retinal effects of Op Art, as well as the trance-like Minimalist explorations of color by artists such as Frank Stella, Ellsworth Kelly and Josef Albers. "There are echoes of Cubism here and Vlaminck's Fauvism, of mid-century abstraction, German and neo-Expressionism, rock painting, folk art, and fabric design," wrote Jerry Saltz in 2011, the year of the present work. "... I think of magic carpets and magnetic fields. I spy networks of Martian canals and landscapes folding over themselves. I glimpse one of painting's oldest purposes: the uncanny ability to conjure beings and invoke spirits," (J. Saltz, "Making the Spirits Dance," in New York Magazine, June 5, 2011, http://nymag.com/arts/art/reviews/mark-grotjahn-2011-6 [accessed March 18 2014]). Robert Storr goes further, building an analysis of these works as almost geological phenomena in which the various strata of paint conspire to form masses and crevices of color that bleed into one another, (R. Storr, 'LA Push-Pull/Po-Mo-Stop-Go', in Mark Grotjahn, exh. cat., Gagosian Gallery, London, 2009, p. 5). In their capacity to evoke both the natural and supernatural, whilst synthesizing multiple artistic languages, the Face Paintings return the medium to a kind of ground zero, allowing Grotjahn to explore new possibilities both for painting and for one of its most time-honored subjects: the human face. The Face Paintings constitute a striking re-development of Grotjahn's renowned Butterfly Paintings which, initiated in the early 2000s, represent another important strand of his practice. In this extensive series, Grotjahn uses colored segments and skewed perspectival lines, fanned out from a central point to resemble the wings of a butterfly. The sense of graphic, almost diagrammatic execution in these works is certainly traceable in the Face Paintings, in which the dense topography of intersecting lines creates a destabilized sense of depth, playing with the viewer's perception of three-dimensionality. Indeed, Grotjahn's early work established his capabilities as a skilled draughtsman, from the Sign Replacement Project that involved him making careful copies of shop signs and trading them for the originals, to his abstract experiments with multiple vanishing points in the late 1990s. In the present work, however, we can see how this tendency merges with a new sense of impassioned expressive gesture, in which rudimentary facial features begin to take form amidst a wilderness of abstraction. "The Face Paintings allow me to express myself in a way that the Butterflies don't," claims Grotjahn. "I have an idea as to what sort of face is going to happen when I do a Face Painting, but I don't exactly know what color it will take, or how many eyes it's going to have," (M. Grotjahn, quoted in interview with J. Tumlir, 'Big Nose Baby and the Moose', in Flash Art, No. 252, January-February 2007, http://www.flashartonline.com/interno.php?pagina=articolo_det&id_art=28 &det=ok&title=MARK-GROTJAHN [accessed March 18, 2014]). In this regard, the Face Paintings may be understood as expressing a renewed faith in the uninhibited freedom of the artist's hand. The mixture of control and abandon we witness in the present work involves the viewer in a dialogue between the known and the unknown, the recognizable and the alien, in a manner that may be said to shed light on its subtitle (In and Out of the Darkness Face 43.01). As Roberta Smith reminds us, "[t]he radiating, ricocheting lines never submit; the flaring planes never emerge. The faces hold their own, if just barely, to affirm in staunchly contemporary terms the human presence behind all art," (R. Smith, "Mark Grotjahn: Nine Faces," in The New York Times, May 12, 2011, http://www.nytimes.com/2011/05/13/arts/design/mark-grotjahn-nine-faces. html?_r=0 [accessed March 18 2014]).